So You’ve got the REST API for your application, and now you want to secure it. How to do that? There are several popular ways to do that, ranging from Basic Authentication to a full fledged OAuth2 security solution. 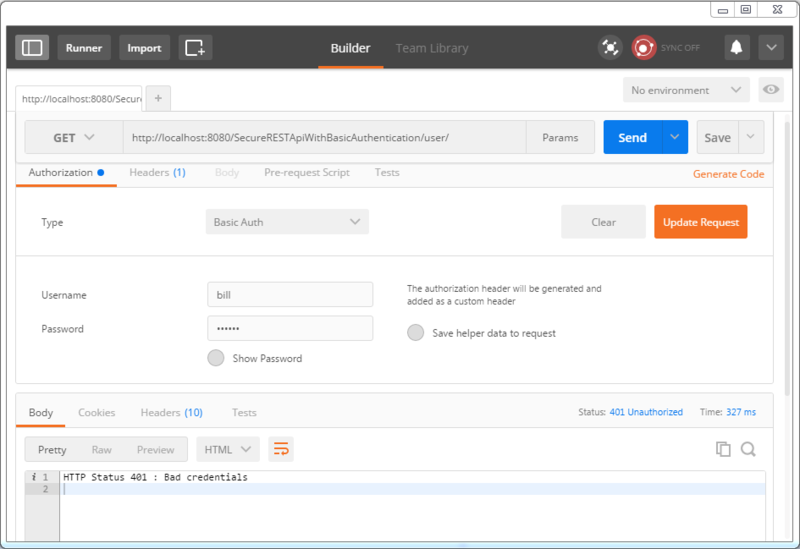 This Guide explains securing REST API using Basic Authentication with help of examples involving two separate clients [Postman & a Spring RestTemplate based Java app] trying to get access to our REST API. 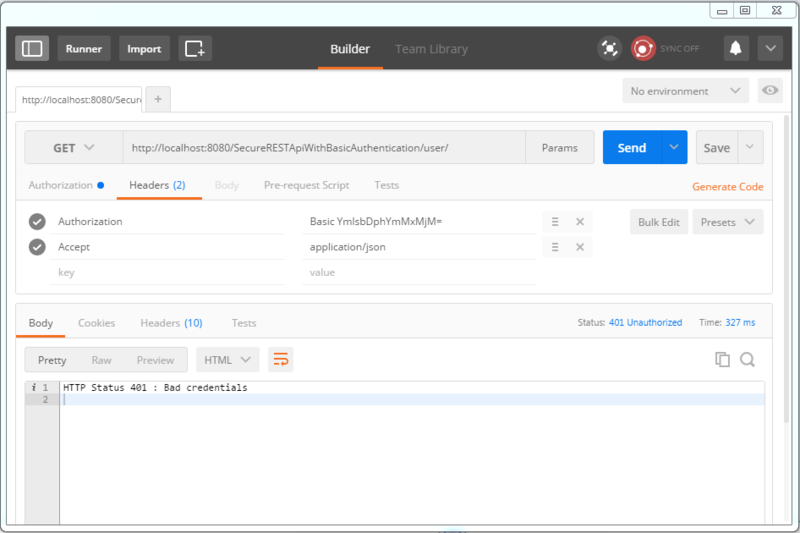 We will be showing the same example with OAuth2 in the next post Secure REST API using OAuth2. As always, complete code can be found in attachment at the end of this article. Let’s get going. In case you are looking for AngularJS based app using Basic Authentication, Post AngularJS BasicAuthentication using Spring Security shows how this application can be used with an AngularJS client. Traditional authentication approaches like login pages or session identification are good for web based clients involving human interaction but does not really fit well when communicating with [REST] clients which may not even be a web application. Think of an API over a server which tries to communicate with another API on a totally different server, without any human intervention. Basic Authentication provides a solution for this problem, although not very secure. With Basic Authentication, clients send it’s Base64 encoded credentials with each request, using HTTP [Authorization] header . That means each request is independent of other request and server may/does not maintain any state information for the client, which is good for scalability point of view. A Word on HTTPS : For any sort of Security implementation, ranging from Basic authentication to a full fledged OAuth2 implementation, HTTPS is a must have. Without HTTPS, no matter what your implementation is, security is vulnerable to be compromised. Shown below is the sample code for preparing the header. This header will be sent with ech request. Since Credentials [Base 64 encoded, not even encrypted] are sent with each request, they can be compromised. One way to prevent this is using HTTPS in conjunction with Basic Authentication. With two steps, you can enable the Basic Authentication in Spring Security Configuration. 2. Configure authentication entry point with BasicAuthenticationEntryPoint : In case the Authentication fails [invalid/missing credentials], this entry point will get triggered. It is very important, because we don’t want [Spring Security default behavior] of redirecting to a login page on authentication failure [ We don’t have a login page]. 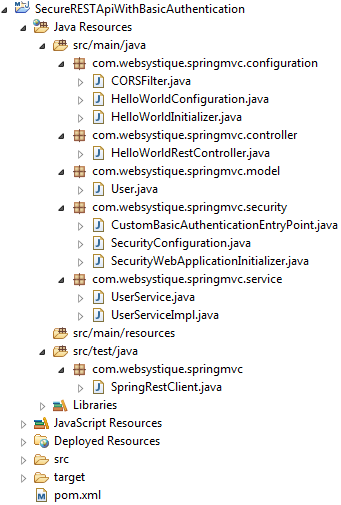 Shown below is the complete Spring Security configuration with httpBasic and entry point setup. .and().sessionManagement().sessionCreationPolicy(SessionCreationPolicy.STATELESS);//We don't need sessions to be created. And the actual Entry point, which will get triggerd if authentication failed. You can customize it to send custom content in response. //Authentication failed, send error response. 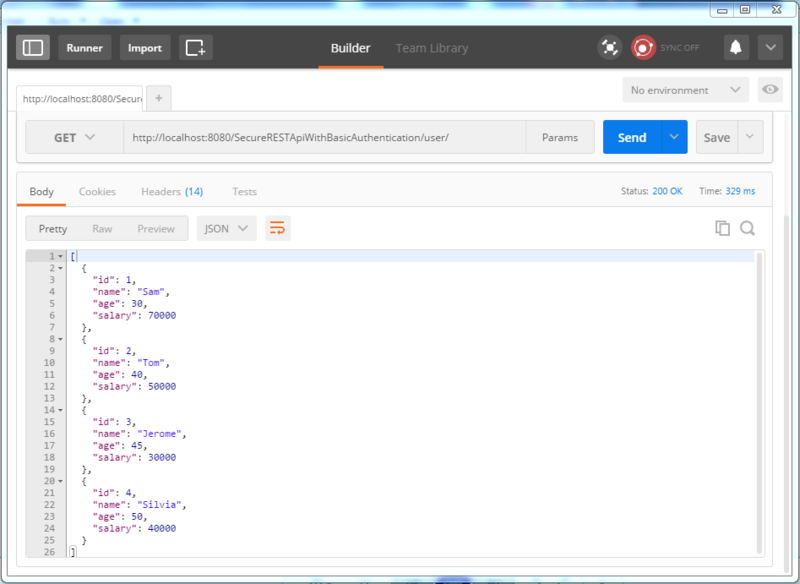 Simple Spring REST API, which serves user(s). A client can perform CRUD operations using Standard HTML verbs, compliant with REST style. Build and deploy the application [on tomcat e.g]. Run it and test it using two different clients. Send a request to get the list of users. You would get a 401 instead. Now select type as ‘Basic Auth’ from dropdown, fill in username/password [bill/abc123], click on ‘update request’. Click on Headers tab. You should see the new header. Let’s add ‘accept’ header as well to enforce json response. Now send the request. You should see the list of users in response this time. Let’s use a full fledged Java client to access our REST API. We will be sending request using Spring RestTemplate. Take special note about how we are setting up the headers for each request, before sending the request. 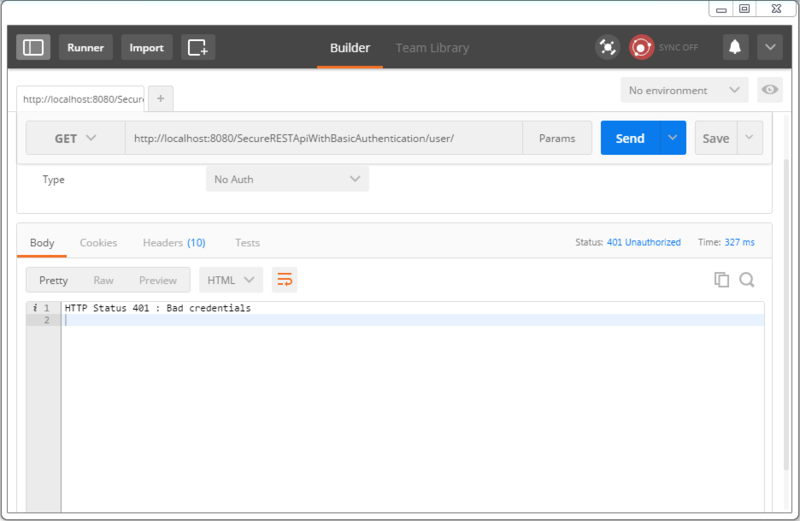 * Add HTTP Authorization header, using Basic-Authentication to send user-credentials. * Send a GET request to get list of all users. * Send a GET request to get a specific user. * Send a POST request to create a new user. * Send a PUT request to update an existing user. * Send a DELETE request to delete a specific user. * Send a DELETE request to delete all users. Service being used in this example is shown below. The complete code can be found in attachment. Finally, shown below is the project structure for this example.